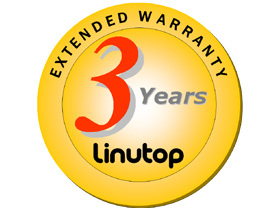 The Extended Guarantee is for a period of three (3) years from the date of purchase, that this Linutop computer Product (“Product”) is free from defects in material and workmanship (“Extended Guarantee”). After defect observation, product will be fixed or replaced and put back in delivery within 24H. Click for Terms and Conditions PDF.